Yesterday, Thursday October 23, 2014, was apocalyptic. The weather we had here in the Seattle area was remarkable and unprecedented. And during all this, a Solar Eclipse. © Paul Conrad/Pablo Conrad Photography – The horns of a solar eclipse peek over the flag flying at the intersection of Northwest and Birchwood Avenues in Bellingham, Wash., during the partial solar eclipse on Thursday afternoon Oct. 10, 2014. I didn’t expect to see it. The clouds and rains continued throughout the morning. I thought my plans to shoot it were thwarted so I opted to get caught up on house chores. While doing laundry, I kept an eye out for the clouds to part. Oddly enough, the rain stopped and the sky cleared just as I put in the last load into the dryer. Sweet. 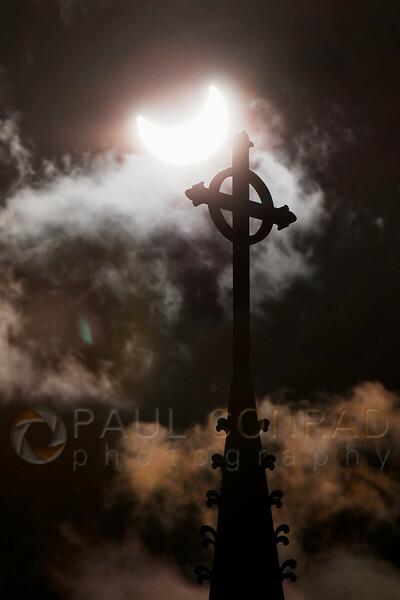 © Paul Conrad/Pablo Conrad Photography – The partial solar eclipse and the cross at St. Paul’s Episcopal Church. While shooting this, I realized a thin veil of cloud would help bring the foreground object and eclipse into the dynamic range of the camera. Lacking the phone and my computer as they were in the house, I grabbed my B+W ND3 neutral density filter to look at the sun. The eclipse hadn’t started yet. As I didn’t know the weather would cooperate, I hurriedly finished the laundry (ie threw it on the bed. LOL) and headed out to check on a few spots I planned out. So, I headed out to my first place: St. Paul’s Episcopal Church at the intersection of Walnut and Eldridge Avenues. 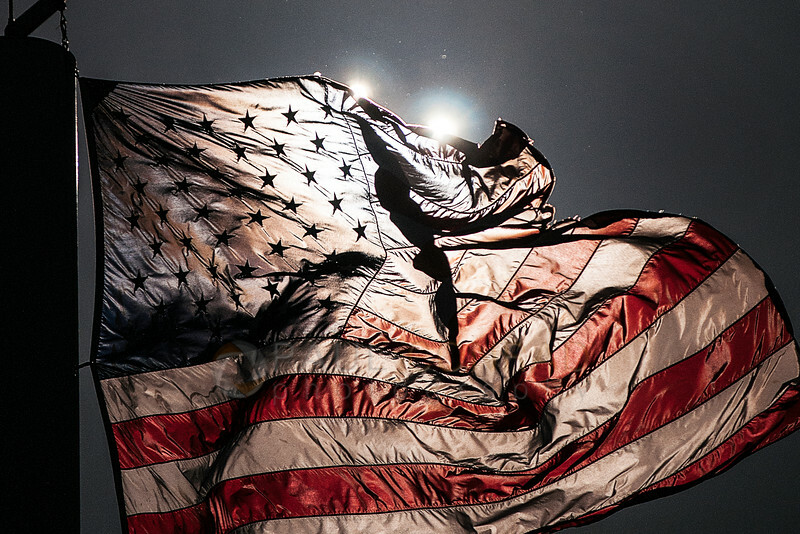 While driving there, I saw how the wind was whipping a large U.S. flag on a tall pole as I passed it. 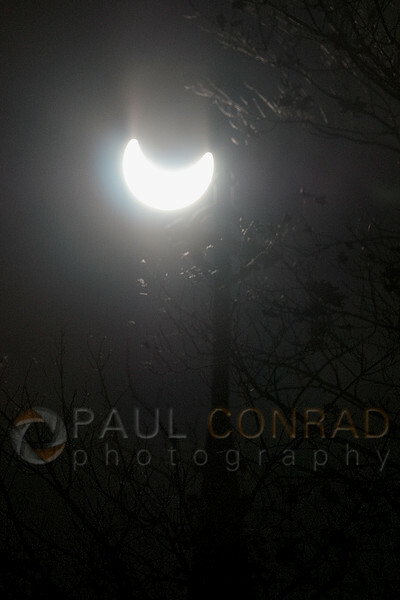 So I turned around to photograph the progressing eclipse. But, after shooting a few frames, I looked at the photos and saw how over exposed the images were. With that, I chose to use my ND2 neutral density filter with its 6 stop loss of light. 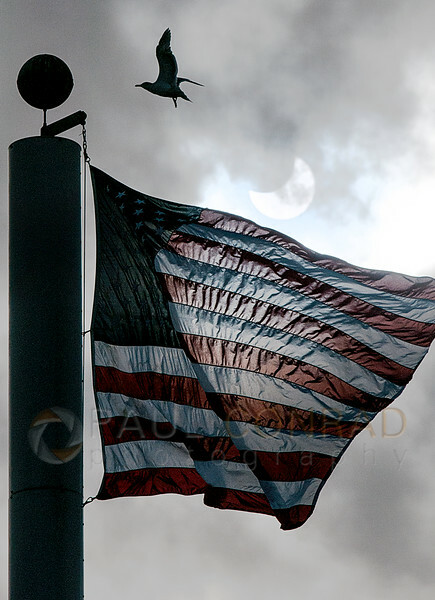 This allowed me to shoot at a high shutter speed while maintaining a wide aperture..
© Paul Conrad/Pablo Conrad Photography – A seagull lands on the flag pole at the intersection of Northwest and Birchwood Avenues in Bellingham, Wash., during the partial solar eclipse on Thursday afternoon Oct. 10, 2014. Plus it cut the light to protect the interior of the lens and lessen the intensity of the light hitting the sensor. With a few better exposed frames, I left then headed to my original place. Upon arriving, I found a parking spot that gave me great flexibility to move, but I couldn’t align the cross with the eclipse. The positioning required me to shoot through a tree. But I was able to frame the duo with the branches of the tree. However, I couldn’t get a decent exposure. Either the eclipse was blown out, or the foreground was black. Very difficult to expose for it well. 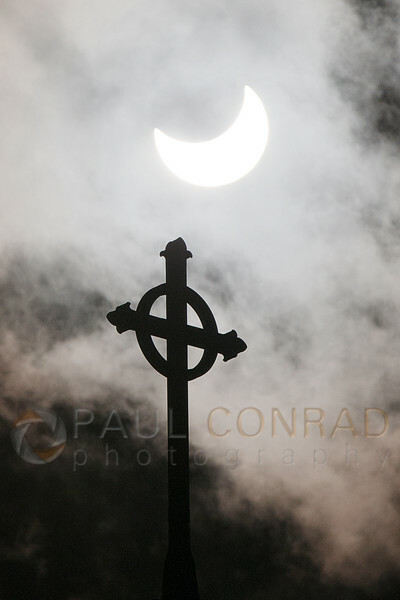 © Paul Conrad/Pablo Conrad Photography – The partial solar eclipse and the cross at St. Paul’s Episcopal Church on Walnut Street in Bellingham, Wash., on Thursday afternoon Oct. 10, 2014. As much as I hated it, I needed clouds. Thin clouds would cut down the light and allow the eclipse to show. This would help balance the exposure. After 10 minutes, I decided to drive to Assumption Catholic Church. This also allowed the eclipse to progress and the clouds to move in. When I got to the church, it was clear it wouldn’t work. By this time, the clouds were moving in rather quick. I headed back to the parking lot by the Episcopal church. When I arrived, the eclipse was lower to the horizon and the clouds were cooperating. The tree was no longer a bother. While shooting, I noticed how the cross would silhouette against a bright cloud that also dimmed the eclipse. The clouds were moving fast, so I needed to move fast. And what do you know? A pickup truck was parked right where I need to be. So with me running around this truck in the parking lot working the eclipse before it disappeared, I’m sure it looked weird to anyone watching as I ran around the truck pointing my lens towards the heavens. Paul is a Seattle-based photojournalist specializing in news, sports, feature, travel, and portraiture. He also photographs weddings and portraits in Bellingham, Whatcom County, and Skagit County.